After Millbank, nobody knew what was going to come next, but could it have been predicted that we’d return to the aesthetics of the black bloc? After Millbank, despite the escalated forms of action that took place, the distinctions of good protester/bad protester, anarchist/liberal, student/worker were hard to uphold. 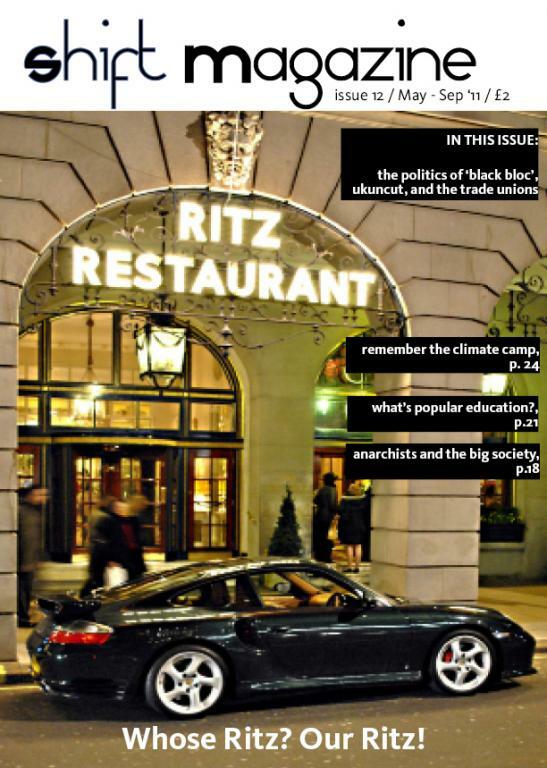 But what did the smashing of the Ritz, on March 26th, amongst other ‘symbols’ of capitalism/wealth, signify? Smashing up Oxford Street and the militant forms of ‘action’ that took place on the day no doubt felt exciting, a break from several things - passive marching, respect for private property, obedience to the law etc. And in this way they can certainly be experienced as transgressive - revolutionary even - a ’step up’ from the traditional lobby, march, go home format. 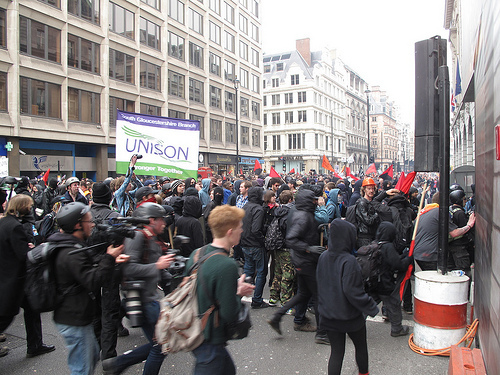 This was the first time that you could seriously talk of a black bloc in the UK. Spontaneous and presumably unplanned, this did not hamper the unravelling of events once people got to the West End/Soho: surrounded by the symbols of wealth and capital, energy high, the city became an outlet for the frustration of the workers, students and unemployed who took part. However, although there were elements which felt like markers of progress on the day - the levels of militancy, the amounts of students still active since the education protests and the unquestionable antagonism toward the current political/economic system - there were also familiar flaws and potentials which weren’t taken advantage of. While the black bloc was vanguard in its form of action (we mean this both in a negative and a positive sense: negative in its separatism and scorn towards public sector workers on the demo; positive in its move to create a discursive space outside of the sanctioned and sanitised world of Barber, Miliband & Co), its content was a shameless and at times embarrassing political patchwork borrowed from the much more articulate UK Uncut and from social democratic populism dressed up as ‘class war’. 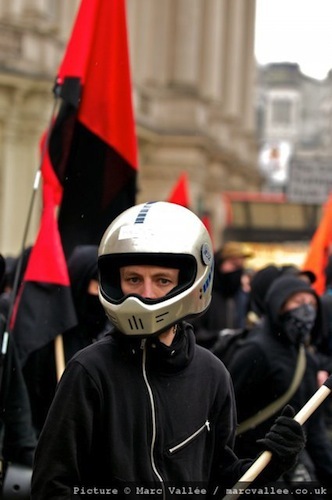 Black bloc tactics are an important strategy to protect ourselves and to maintain the same anonymity that the authorities use to protect corporations, the police, etc. But a strategic focus on tactics should come hand-in-hand with a political strategy and analysis. At a time when the discourse of the anti-globalisation left makes sense, with the political/economic system blown open and exposed for what it really is, how do these forms of action make use of this opportunity and resonate with those outside of the militant activist ‘ghetto’? But then again, the UK Uncut message, however media friendly and attractive it may seem is also deeply flawed. By focusing on tax evasion we run the risk of supporting the legitimacy of the state and hiding the inherent inequality of capitalism beneath calls for fairness (‘we pay our taxes, why don’t you’). Attempts at trying to match up this ‘lost money’ with the budget cuts also serves to mask the political element of the cuts behind simple, technocratic solutions. For many anarchists and anti-capitalists there was a strong ‘get rid of the rich’ message. Whilst this might be a first step toward a class analysis we must be careful with anti-rich politics. Millionaires are not the same as the bourgeoisie. From many anarchists there was a peculiar combination of ’smash the state’ but also calls to ‘tax the rich’ (presumably a call to increase income tax, inheritance tax, taxation of financial transactions, and similar). While no-one was arguing for austerity, no-one really seemed to be making the case for ‘luxury for all’ either. Arguments that placed capitalism at blame, structurally, for blocking universal prosperity, were lacking. The ‘anarchist’ alternative seemed to rely almost entirely on the redistribution of wealth, rather than on the argument that there is no distribution without production, and that it is this sphere of work that we have to address to really provide a class struggle alternative and an alternative to the attacks on our quality of life. Whether we were smashing windows, occupying Fortnum and Mason’s or marching on the main demonstration, there is clearly a concern here that we are separating ourselves off, giving ourselves a very distinct identity from each other, from ‘ordinary people’. Contrary to Millbank and Dec 9th, where even Cameron admitted that a majority of people were making trouble, March 26th saw the dusting off of the traditional protest narratives of the violent minority. So if there’s a group of maybe a few thousand annoying the cops in Piccadilly/Trafalgar Sq. 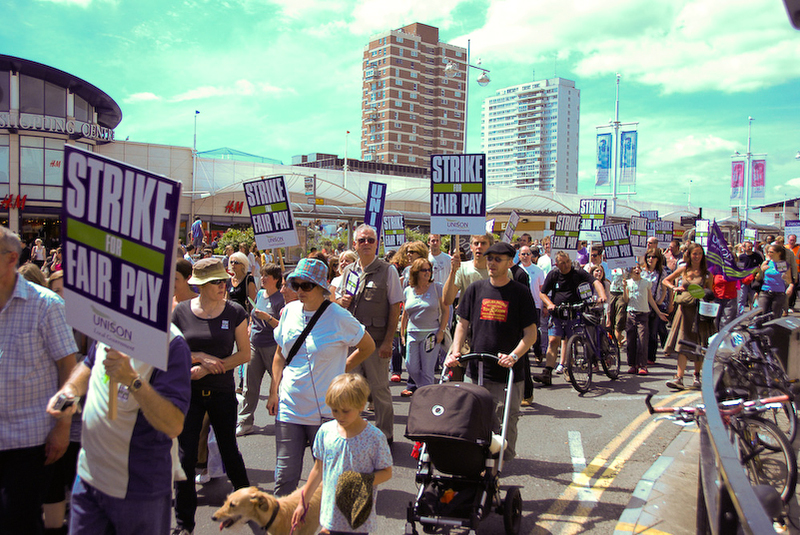 while 300,000 are listening to speeches by the Labour leader, there’s clearly the question of how we relate to wider struggle against cuts, especially those of the public sector workers present. This will be a key task in the coming months - one which is, unfortunately, much harder than breaking a plate glass window. Well, we should have seen it coming. The police, media and protest organisers were talking up the prospect of “violent troublemakers” “hijacking” the TUC march for weeks in advance of March the 26th, and a few smashed windows and paint bombs later, they showed us - in the words on the Daily Telegraph - “Britain's face of hatred” in all its spectacular glory. The distinction between “legitimate”, “peaceful” protest on the one hand, and on the other the “violence” of property destruction was used and abused in the aftermath the demonstration, with Teresa May describing “black shirted thugs” rampaging through the West End, championing the arrest of 146 protesters and outlining further curbs to the right to protest. While the number of arrests was consistently quoted in the media within the context of “violence”, the overwhelming majority (138) of them came from the mass arrest of the peaceful occupants of Fortnum and Masons. In fact, only three people were charged with criminal damage, and two with assaulting police officers. While the binary distinction between “peaceful protesters” and “hooligans” is obviously questionable, there is some mileage in comparing the actions of UK Uncut and the black bloc. Mainly, this is because of the nature of the targets. Some of those of the bloc's were simply posh shops and other ostentatious displays of wealth, Topshop was smashed because of the Arcadia group's tax dodging, and the Ritz Hotel is owned by the Barclay brothers, who live offshore their own Island, Brecqhou. Fortnum and Masons, which was occupied by UK Uncut, is owned by Wittington Investments and has its own elaborate tax-dodging schemes. In this article, we want to look at some of the issues surrounding both forms of protests, and make some suggestions for the direction of the anti-cuts movement. The UK has seen a wave of high-street demonstrations under the banner of the UK uncut campaign, many of which have been organised locally following call outs distributed through the internet. The protests have seen a number of stores associated with Tax-Dodging picketed, occupied and flyered in cities and towns up and down the country. The targets of the campaign have been pretty specific. The most high-profile company to be taken on has been the UK-based telecoms giant Vodafone, which is the most profitable mobile phone operator in the world. Last year veteran investigative magazine Private Eye broke a story on Vodafone's successful tax-dodging, which had involved setting up a subsidiary company in Luxembourg purely to route profits from the company's acquisition of Mannesman through a country with a more agreeable tax regime. After a lengthy legal battle, which apparently was going HMRC's way, the taxman agreed to let Vodafone pay a tax bill of £1.2 billion, rather than the full £6 billion in estimated tax. Vodafone have since dismissed the £6 billion figure as a “urban myth”, despite the fact their accountants projected for it in their own bookeeping. Understandably, the story produced a groundswell of anger, of which these demonstrations are a product. Target number two is head of the Arcadia group empire - and author of the Efficiency Review advising the government on how to shape its cuts - Sir Philip Green. Green, who made his fortune on the back of workers in South Asia working 12 hour shifts for poverty wages, took home a paycheque unprecedented in UK history when he paid himself £1.2 billion in 2005. This was paid to his wife, living in the tax-haven of Monaco, so as to avoid tax. The demonstrations have garnered a good deal of attention from the authorities and the media, both of whom have launched investigations into the “ringleaders” of the protests. On their own, the demos have caused a fair bit of disruption, and brought to light the fact that the same government seeking to impose historic cuts in the standard of living in the UK is also allowing its friends in business to avoid fulfilling their tax obligations, if nothing else shattering the great lie that “we're all in this together”. Furthermore, the basic logic of the callouts is the need to uphold the rule of law – these companies have a legal obligation to pay their taxes, which they shirk. This much is stated up front by UK Uncut, who, styling themselves as “big society revenue and customs”, state that “if they won't chase them, we will”. Essentially, the argument as it stands is for the state to live up to it's promise and to actually deliver on the idealised face of its material function. The role of the state in capitalism is to underwrite the functioning of the capitalist market. The state is a prerequisite of capitalism in that the ability to guarantee private property rights and therefore the ability to buy and sell requires a legal and judicial system and repressive state body there to make those rights possible. What makes any property yours or mine, but much more importantly what makes the property of the capitalist his is ultimately the ability of the state to adjudicate and guarantee that he can dispose of his accumulated wealth as he pleases. In practice this means the need to mediate parties and maintain the social fabric in the face of potential unrest – translated into bourgeois ideology in its current, successful iteration as an even-handed regime of “fairness” where we are all taxed, prosecuted, and end up on the receiving end of cuts fairly. Witness every political party attempting to outdo one another by positing the “fairness” of their plans for the economy and attacks on working class living standards in the UK. The state is a subject of criticism because it fails to fulfil its promised role correctly, not because this promised role, along with the toleration of tax avoidance and the regime of austerity all step from its role as a key actor in the continued existence of capitalism. However, saying this is not to dismiss these protests out of hand or deny they have positive aspects that can be built on, or that there is no space for growth and dialogue. To remain aloof to nascent movements and all the inevitable contradictions real people in the real world bring with them as they become politically engaged is to condemn ourselves to irrelevance. One positive feature of the demonstrations is the fact that protesters in many cases are willing to create disruption as a tactic. Effective direct action, be it in the form of strike action, demonstrations or occupations is effective by virtue of its ability to disrupt the normal functioning of society. In a society entirely based on the accumulation of capital, this means the disruption of the economy. Occupations of high-street stores have the capacity to inhibit buying and selling and affect directly the normal working of parts of the economy. If we are to effectively resist these cuts, we will have to recognise that ultimately symbolic protests and petitioning representatives to manage capitalism differently isn't going to cut it. 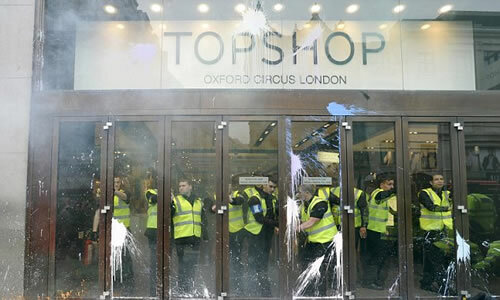 The rowdier of the UK Uncut protests have involved high-street linchpins like Topshop being effectively shut down and unable to trade. Such disruption needs to take the form of mass action, and links need to be built with shop workers – the vanguardist paradigm of a few activists on an “action” supergluing themselves to things is no basis for a mass movement, and promisingly many UK Uncut activists recognise this fact. Another positive aspect of the protests – with qualification - is the fact that the line spun by the government, opposition and media on the ultimate inevitability of the cuts agenda is being rejected. Clearly, the “there is no alternative”, “Britain is bankrupt” line on cuts to public services isn't washing with people, and with good reason – it's hardly a convincing argument when HMRC is haemorrhaging billions in unpaid tax. This rejection is obviously positive. However, this needs to be qualified. Ultimately, if those on the receiving end of these attacks feel the need to balance the state's books on capital's behalf by offering alternate solutions to Britain's deficit there is a problem. Firstly, because we can question the degree to which public debt is a “problem” for capital anyway, as opposed to an integral part of the functioning of states in today's world which is neither inherently “good” or “bad”.1 Secondly, the overall subordination of everyday life and our needs to those of the economy needs to be questioned. Many attacks on tax-avoidance take the desirability of a healthy national economy as a given, with tax-dodging companies being seen as at least in part to blame for capitalism's present difficulties. Of course, nascent movements are going to be full of contradictions. People don't develop a perfect analysis (if such a thing exists) overnight, and any mass movement against the cuts that may appear is going to be full of all kinds of illusions in social democracy, the labour party, the petitioning of our representatives, the rule of law and order and so on. There remains the possibility of escalation and radicalisation, that participants in such campaigns can move beyond the initial limitations they have. There are a number of positives to such protests which can be built on without tempering constructive criticism. There are criticisms to be made of black bloc-type actions too, but first it is necessary to question some of the common assertions about these kinds of protests, which inform some of the most common criticisms. One obvious point to make is that the policing of protests, even the “fluffiest” of peaceful demonstrations makes any situation implicitly violent. The role of the police is to exercise the state's monopoly on violence; under capitalism this means providing the underpinning of commodity exchange and capital accumulation by guaranteeing property rights and containing any social unrest that could pose a threat to capital. In the context of a demonstration, the police's presence represents ultimately the threat of state violence. Another obvious point is that property destruction is not violence – violence is the harming of living things, breaking a window is damaging an inanimate object which can be replaced by another. By this reasoning, the overwhelming majority of the black bloc's actions were nonviolent. However, there are criticisms to be made of this kind of spectacular protest. One is practical – the risks involved as far as prosecution goes compared to the outcomes are significant. Another is that the black bloc strategy can lend itself to a kind of protest tourism and the separation of political action from our daily lives. There are many activists for whom politics is something they do at the weekends, “actions” unrelated to day-to-day organising and agitation in communities and workplaces, the front line of our exploitation by capital. There isn't much evidence that this was the case in London, but nonetheless it is a tendency associated with these kinds of actions that must be borne in mind. March 26th was inspiring, both in the numbers who turned out to show their opposition to austerity and the willingness of many to break out of the straightjacket of police-”facilitated” protest. But mass demonstrations like it are not going to beat the cuts. Ultimately, being right isn't what matters. We can turn out in the hundreds of thousands to make the point that the deficit is a fraction of what it was for decades after the war, that the cuts aren't necessary, that they are opportunistic, that they are laying the bill for the financial crisis at the feet of those who didn't cause it, that the government could raise funds by cracking down on tax evasion, by selling the banks it owns, by returning corporate tax levels to somewhere near what they were for most of the postwar period, etc, etc. We're right, but that isn't what matters. What matters is the balance of power between capital on the one side and those it exploits on the others – all those who have to work for a living, will have to work for a living (students) or those who must scrape by on the dole. The government feels confident enough that they won't face significant resistance that they're even cutting the pay of the police and prison guards. So how do we go about building a movement against austerity that can win? First, by resisting attempts to divide and rule. We have to reject the narrative of “peaceful” protests being hijacked by “extremists”, of property destruction as being inherently “violent”, or of UK Uncut being the legitimate face of direct action as opposed to hooded youths. Secondly, by taking what is effective from the protests which have emerged so far. Occupying a shop en masse and denying it a day's trading is an effective way of causing economic disruption for those who are not in a position to go on strike or take other workplace action. This logic can be expanded to carrying out economic blockades, which have been used with success in the past 20 years as part of protest movements in South America and France. 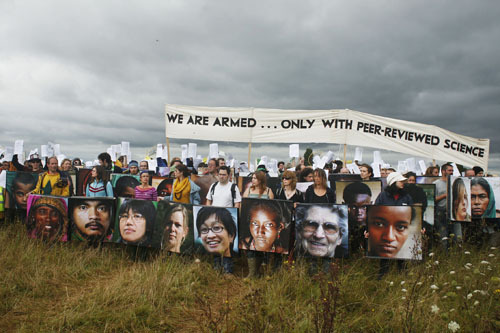 Direct action is only meaningful when it is mass action which has an economic impact – it is alienating and counterproductive when it becomes the preserve of activists “doing actions” for their own sake. Thirdly, by not fetishing “non-violence” - either as unthinking reverence for property even when it belongs to a company like Fortnum and Masons, or refusing to defend ourselves in the face of police violence. Peaceful protesters chanted “this is not a riot” and held up their hands as they were brutally kettled and dispersed during the G20 demonstrations in 2009 – it didn't stop them being beaten by the police. Originally published in Shift magazine. Popular Education often appears as a panacea for the anti-authoritarian Left. Inga Scathach looks at the uses and abuses of the term and the practices. Originally published in May 2011. There’s the rumbling of a groundswell. You can hear it murmuring if you eavesdrop at activist-type gatherings. Unless you listen really closely, you may be mistaken in thinking it to be another utopian proposal, flung haplessly into the ring of consensus decision-making. But this is not a recent radical fad to be horizontally-organised beyond all recognition: popular education has been practised in Latin America for the past 70 years. Developed as a way of working with politically marginalised communities to identify the sites of their disenfranchisement and act towards addressing it, the region’s political ignition has seen its popularity grow. From its emergence in Brazil, the technique has gone global in the past 30 years, with particularly strong uptake in countries (at the risk of falling into lazy categorisations) in the global south. What distinguishes popular education from other forms of education? And why is it increasing in popularity? Largely credited to the fieldwork and writing of Paulo Freire, popular education is based on the recognition that conventional forms of education replicate the oppressor-oppressed relationship. This Hegelian understanding addresses the authoritarian approach favoured by formal education as a dialectical relationship. By drawing on Hegel, it also echoes Marx’s bourgeoisie-proletariat dichotomy, and allows us to understand education in the context of the social relations that exist to reinforce capitalist and colonialist functions. By recognising the function of traditional forms of education as hegemonic, popular education supposes to offer a radical alternative that emancipates participants rather than perpetuating their subjugation. So, how does it work in practice? It is first important to note that even within a form of education that eschews the prescription of a curriculum, popular education theory has an aim: to address political marginalisation and confront hegemony as an emancipatory process. The main aim of popular education is understood as conscientisation (a somewhat clumsy translation from Freire’s native Portuguese - conscientização) for action. Both components are key here, as “to surmount the situation of oppression, people must first critically recognise its causes, so that through transforming action they can create a new situation.” Conscientisation is a process of increasing critical consciousness of our present condition and the situation of self within existing power dynamics, and feeling compelled to respond to this by taking action. Popular educators reject any notion that people can become politically conscious without also wanting to act on their understanding, or that genuinely political action can take place without analysis. Consciousness and the will to act are acquired simultaneously and are facets of the same process. In order to build a political awareness, learners and educators need to participate in a mutual process of unpacking each others’ ontological assumptions. Henry Giroux acknowledges the imperative of dialogue and discussion in this exploration of ideas by referring to developing a “language of critique” and “language of possibility”. Reluctantly drawing tenuous connections between recent political developments in the UK and an ongoing global emancipatory project, there appears to be a correlation between growing interest in forms of education and rapidly diminishing economic and political agency: the simultaneous decimation by the British right of what little democracy remained in Higher Education has coincided with the launch of the government’s meritocratic Free School programme; meanwhile, there has been a surge in alternative education projects such as the Really Open University, Really Free School, Ragged Universities and Open Schools, while large numbers of school, college and university students of all ages are becoming radicalised into direct action and property destruction. Having been the preserve of education theorists and a clutch of radical educators, the buzz around popular education is getting steadily louder in our changing political climate. But is it a helpful tool, a cumbersome methodology or a lethal weapon? Does it work? It’s not just radicals and progressive educators on the left that are falling over themselves to comment on this project. The inclusion of Freire’s Pedagogy of the Oppressed on the reading lists of most US teaching programmes (and many UK ones) has triggered a backlash from the hard right. Sol Stern asks “How did this derivative, unscholarly book about oppression, class struggle, the depredations of capitalism, and the need for revolution ever get confused with a treatise on education that might help solve the problems of twenty-first-century American inner-city schools?” Stern’s question is a sobering reminder of the vulnerabilities of our approach, and of too hastily extrapolating meaning from a few snatched phrases of conversation or comments on Indymedia. The word on the street might be that popular education is where things are at right now but adopting popular education methodology is not necessarily indicative of political perspective. That its key theories are being explored within the American educational establishment should be enough to temper any blind acceptance or over-zealous enthusiasm. If we come good on our intentions to be honest with ourselves, popular education is discussed frequently in radical circles but rarely translates into practice. One theory is that conscientisation is crippled by process. Through facilitated and mediated workshops, rather than open and dynamic storytelling, exchanges of experience become neutered. Without the shared learning and emotional outpouring of lived experience, individual perspectives prevail, and the process fails to find the flash-point of community solidarity, indignation and a call to action. Non-radical educators put popular education techniques into practice regularly. It’s easy to use participatory methods and use words like “empowering” and “inspiring”. However, the explicit aim of popular education is to inspire action, which raises questions about the integrity of many so-called popular education projects. So, how can we ensure that popular education doesn’t become just a toolkit for facilitating yet more meetings? It would be naïve to believe that the oppressor-oppressed relationship is simply a relational dichotomy between individuals. The true oppressor-oppressed dichotomy is internalised - with the oppressed replicating the behaviour of the oppressors, with which they have become acculturated, and vice-versa - and can only be addressed through honest self-reflection and evaluation, or praxis. The nature of this internalised dialectical relationship means even the most committed pedagogue is still engaged in a process of self-emancipation. In part because of this impossibility of fully transcending the self, popular education is not inherently anti-oppressive. In fact, at times it can replicate the very same social relations it attempts to expose. From a feminist analysis, the emphasis on sharing lived experience through storytelling has been used to feminise political projects and legal battles. In a group dynamic, it also allows the loudest voices to dominate, and these usually reflect the relational privileges in the group. The abiding struggle of educators is to facilitate without leading. In trying to create space for horizontal learning, popular education practitioners risk exposing themselves and learners to the tyranny of structurelessness (ed. : for more, see Jo Freeman’s seminal 1970s text The Tyranny of Structurelessness) - whereby hierarchies become established via the attempted negation of their very existence. The rhetoric of popular education, with the specialised terms and concepts discussed in this article, raises questions of who has access to what information and who then controls the content of discussions and flows of dialogue. Both Arlene Goldbard and Joao Bosco Pinto have criticised the all-too-frequent attempts of self-styled activists to embark on ‘awareness raising’ crusades, involving the dissemination of pre-selected knowledge misleadingly branded as popular education. Although increasing numbers of practitioners are adopting popular education techniques in various settings, there is no possibility of an emancipatory encounter without confronting our own motives, and abandoning the mythology of consensus. Theory aside, the practice of popular education is a sticky affair. With an arsenal of techniques that includes theatre, storytelling and art, popular education carries the risk of being adopted by liberal arts organisations or the kind of social movements that promote self-improvement over confrontational political action. As with any radical project, there exists the tendency to fascinate and attract lifestyle activists, and while this seems somewhat contradictory to its raison d’être, popular education is proving no exception. In spite of aiming itself squarely at politically marginalised communities, it is frequently co-opted as a tool for the left to wave around while only really putting it to any use within existing networks. Popular education is not imperative for conscientisation, merely an approach to developing it. The international student protests that have been taking place over the past six months demonstrate that students are developing a critical political consciousness and, crucially, innovating and hybridising modes of action in direct response to understanding the conditions of our existence. Our marginalisation is not over land rights or indigenous practice, but it is still over our political agency. We are educated with the linguistic and creative skills to articulate our desires, but we cannot yet transcend the dialectical relationships that govern our lives. It is the political climate, not an educational paradigm, underpinning the conscientisation of today’s students. In response to hooks’ comment, is there still a place for popular education when social movements emerge? Perhaps a useful way to see popular education is as a method of agitating for conscientisation where the conditions for this don’t already exist. This means recognising the goal of popular education as planned obsolescence. As an approach confounded with contradictions, perhaps it only reaches the point of resolution when its continued existence is no longer required. Are we radical enough to face the facts?